It is common practice in the HVAC industry to install air conditioning units on commercial building rooftops. For a long time, only commercial settings were used for rooftop air conditioning units but in recent years, there has been a trend toward roof mounted air conditioners on residential properties. However, not every house can qualify for this type of air unit. When you engage the services of our HVAC company, our expert contractor will sit down and discuss with you the pros and the cons of a rooftop air conditioning placement. 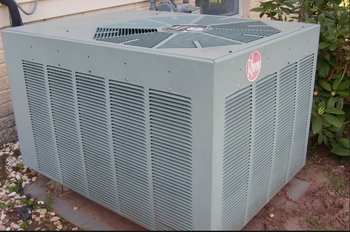 Benefits of a roof mounted unit are: all components of the air conditioner are bundled into the one unit (unlike the split system) and everything is routed through the system's duct work. This roof attached air conditioner decreases the amount of work effort that is required of the whole unit, thus less energy is used, which will help to bring down your electric bill. Commercial type businesses will have the advantage of a significant savings with the placement of a rooftop air conditioner.